“Using a powerful particle gun, we would shoot small pieces of matter through the force field and into the antimatter to make small, controlled bursts of energy…which we could then harness and put into batteries.” This quote reads like dialogue from a science fiction movie set in the distant future. It’s not. The (exponentially more exciting) truth is that it’s actually just a snippet pulled from a pilot TED-Ed Club presentation given by Burlington High School junior, Manas Purohit. TED-Ed Clubs teach students how to give TED-style talks on an idea that truly matters to them. The scope and depth of the topics explored by TED-Ed Club Members during the pilot program was impressive, and some topics were downright mind-boggling. 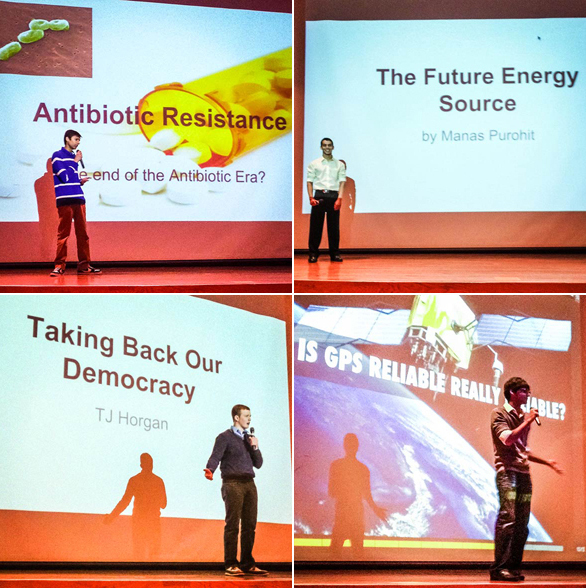 The students at Burlington High School’s topics included the reclamation of democracy, the future of autonomous vehicles, antibiotic resistance and, as mentioned…particle physics! Purohit’s classmate, Ansh Bhammar, also went the science route. A junior at BHS, Ansh has been interested in medicine for as long as he can remember. His TED-Ed Club experience allowed him to delve deeper into the topic. For his final presentation he narrowed his focus to antibiotic resistance, or how certain bacteria survive even after being exposed to antibiotics. He even came up with an easy-to-remember, four-step action plan that laymen can follow to prevent further resistance. Ansh your documentary was really knowledgeable and more importantly helpful. As, you know what, I just used skip dosages of antibiotics frequently ( as I believed that medicines are just rubbish, I will develop my antibodies to fight against bacterias) and then blaming doctors for not curing my diseases. Rather now I just came to know that I was the only person responsible for making my bacterias resistant. So I just wanna thank you for opening my eyes.